American Girl Pleasant Company Kirsten Doll, Trunk & 11 Hard to Find Outfits ETC. This awesome collection i n cludes American Girl. Made by Pleasant Company in original meet outfit with hat, bag apron and spoon accessories. Kirsten Midsummer Outfit (just dress). Kirsten Nightgown & Woolen Slippers. Pleasant Company Kirsten School Dress and Shaw, Ribbons? Pleasant Company Kirsten Summer Dress Outfit with Hat and Red Boots. Saint Lucia Gown, Wreath, Socks and non AG Red Hair Ribbons Winter Skirt with 1 Hair Ribbon, Red Boots and White Shirt. Kirsten Winter Sweater Set (Sweater, & M atching hat) Kirsten Checkered Dress Outfit with Apron and Shawl Kirsten Apron Dress (Birthday Outfit) with Flowered Wreath (no ribbon) Socks and Two Tone Boots Kirsten Plaid Dress Outfit with Shawl and non AG Ribbons Kirsten Drindle Dress Shirt Vest and Skirt (No Shawl). The Kirsten Doll has been retired by American Girl. She has the Pleasant Company etched on her neck, Her legs are tight enough for her to stand easily and she can hold arm poses. Her body is clean and her strings are long. She comes with the original Meet Outfit and most Accessories. Kirsten's body, limbs and hair seem to be in really good condition. As for the other items the The Kirsten Books are in good condition and show just a little wear. The clothes are American Girl label. A few of the outfits may have a tiny spot here and there. The outfits are in great cond. The Saint Lucia crown has a little cracking on top of some of the berries. I don't have the mittens that come with the winter outfit. There are original ribbons for one of the outfits I can't tell if they are dark purple or navy blue. This set also comes with a set of Kirsten books 1-6 and, 3 Books about her from the American Girl Historical Short Story Book Collection 10 Pleasant Company American Girl hangers and a Mini Doll with Book. The trunk is very sturdy it is made of all wood. A small piece of the border is chipped off on one side. Overall this is a lovely set of Hard to find Retired Kirsten Doll Items. All items except the trunk and some of the ribbons are American Girl label. View My Other Items For Sale. If you have a special request ie. I sell primarily dollhouses, dollhouse items, dolls, and other toys. Sometimes one of my listings may contain items that have very small parts. Please remember to keep them out of reach of babies or toddlers, and pets who put things in their mouth. Create listings that get noticed! With Auctiva's 1,800+ Templates. The item "American Girl Pleasant Company Kirsten Doll w Trunk & 11 HTF Outfits etc" is in sale since Friday, June 30, 2017. 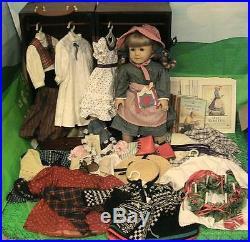 This item is in the category "Dolls & Bears\Dolls\Clothes & Accessories\Modern\Other Modern Doll Clothing". The seller is "muffin5306" and is located in Philadelphia, Pennsylvania.